How do you know if the attachment file you received by email or downloaded from an unknown website is safe to run and not infected by virus? You would probably rely on the antivirus installed on your computer to tell you if it’s safe or not but the fact is, antivirus software is never perfect in detecting and preventing all viruses which is why a bootable rescue disk is made available to clean up the mess when malware takes over the computer. Since every antivirus technology is different, logically scanning a suspicious file that you’ve just downloaded from an unknown site with multiple antivirus would offer a higher detection rate. However, you cannot normally install multiple antivirus software on your computer or else there would be conflicts causing your computer to crawl. A solution to this problem is to use a web based online multi antivirus engine scanner. Basically an online multi-engine antivirus scanner is an online service that anyone can upload files to and have them scanned with many different types of antivirus software. All you need to do is visit the website, browse the file that you want to scan, click a button to start uploading and wait for the scan to run. Within seconds or minutes depending on the server load and speed, the detection results are then displayed on your web browser for you to decide if it is infected or not. Here are 5 public + 2 private online services that allows you to scan suspicious files with multiple antivirus engines for free. VirusTotal is one of the most popular multi-engine online antivirus scanners that was acquired by Google in September 2012. When compared to its competitors, VirusTotal wins in almost every aspect such as speed (thanks to Google’s infrastructure), having the most antivirus engines and features including free public API usage, URL scanning, voting & comment, multiple languages, additional information on the analyzed file and multiple ways to send file to VirusTotal (web, email, browser extensions, desktop programs, mobile apps). Report Page Information: Analysis Date, SHA256, Detection, Comments, Votes, ssdeep, TrID, ExifTool, PE information, ClamAV PUA Engine, date and time of first and last seen in VirusTotal, file names. Scan Remote Files: YES. Go to Scan a URL > Enter direct download link and scan. At the report page, click on the downloaded file analysis hyperlink. Previously known as Filterbit, Metascan Online supports 42 antivirus engines with a maximum 50MB file size. You can only upload the file from their website and when the scan has been completed, you’ll get a nice badge (which can be easily manipulated by editing the URL of the image) to embed it to your website. Not many features are found in Metascan Online but overall the speed of scanning is quite fast. Report Page Information: Analysis date, MD5/SHA1/SHA256, file size, detection, detection ratio via badge, individual AV engine scan time and definition date used. 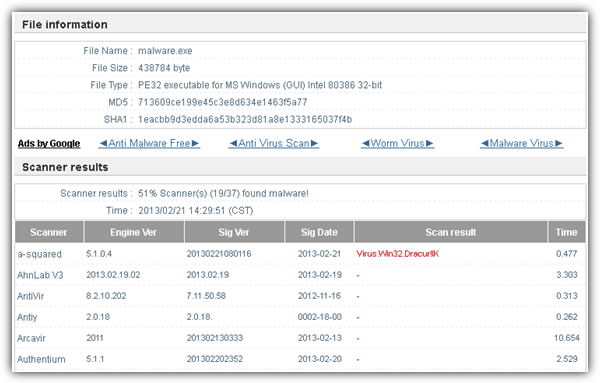 VirSCAN has been around for quite a while as well and is another online scanner that support over 30 antivirus engines. Other than uploading individual files for scanning, it is able to automatically scan up to 20 files if they are compressed into one ZIP/RAR archive as long as it is less than 20MB in size. At the bottom of the scan report, there is a copy to clipboard button to paste the results on forums/emails/website. They are the slowest scanner when compared with the rest on this list because they scan the file with one antivirus at a time and not simultaneously. Report Page Information: Analysis date, MD5/SHA1, file size, detection, detection ratio, individual AV engine scan time, definition date and engine version. Jotti is a simple, fast and straight forward malware scanner that only supports 20 antivirus engines without offering extra features or information. Simply browse the file that you want to scan from your computer, submit and wait for the results to be generated in real time. You can switch the language of the website by clicking on the flag icons. 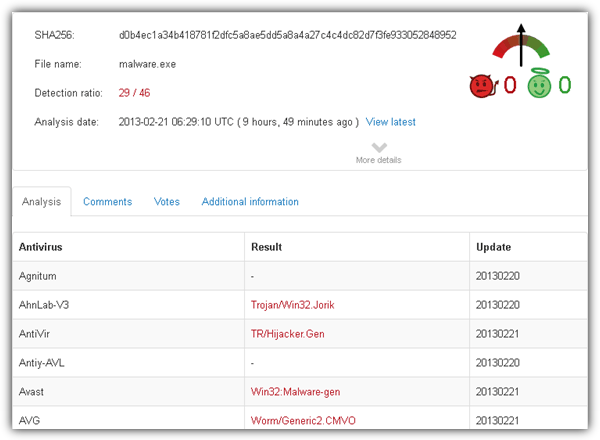 Report Page Information: Analysis date, MD5/SHA1, file size, detection, detection ratio. NoVirusThanks is an Italian company that specializes in security services and software. They are the only public scanner that gives you the option of not sharing the uploaded file with antivirus companies by ticking the “Do not distribute the sample” checkbox before submitting the file. It is possible that the option not to distribute the file is the reason why many other antivirus vendors including the well known ones such as Norton, McAfee and Kaspersky are not interested in having their engine added to NoVirusThanks scanner. Report Page Information: Analysis date, MD5/SHA1, file size, detection, detection ratio, individual AV engine version used to scan. Scan Remote Files: YES. There is a separate box to enter the direct link for scanning remote files without downloading the file to your computer first. chk4me is a private AV checker that offers limited scans for free with the option to select your preferred antivirus engines for scanning. Normally people who create malware use private scanners instead of public ones such as VirusTotal because it doesn’t distribute the file to antivirus companies and will stay undetected for a longer period. Do take note that private scanners will also receive a much lower reputation score at WOT (Web of Trust) most of the time but they are not necessarily dangerous websites. Serenity Scanner is another private AV checker that uses Scan4you API. Unlimited scanning except AutoScanner is only available for 24 hours to new members that can register for free. Additional notes: An online multi-engine AV scanning service is meant to scan individual files that you find suspicious and is not for scanning your whole computer. Do take note that files that are found to be clean by all antivirus does not necessarily mean that it is 100% safe because it might be protected or obfuscated with a crypter to evade detection. It is also possible for an antivirus to wrongly label a legitimate file as a threat, for example; an executable file written and compiled with AutoIt. A real solution to confirm if a file is infected is by using our X-Ray tool to send it to antivirus vendor for manual analysis performed by a human. you forgot about antiscan.me. It is also a no distribute scanner with a decent number of engines. Thanks ray. Beware – some of the links to scanners are mixed up and or lead to false websites. Badly in of overhaul. Thanks for the report, we’ll look into updating it soon. Great article. 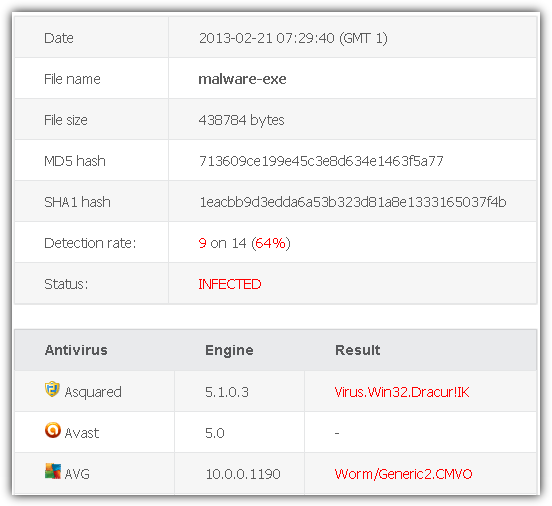 VirusTotal is indeed the gold standard for a 2nd opinion scanner if your primary antivirus is just not cutting it. I’ve recently found a nifty tool that combines the best of both online and offline multiple scanners in SecureAPlus. There very new in this scene but the convenient integration of VirusTotal right at your desktop (no browser needed) is something that a lot of people can appreciate. This was a great comparison. Your time-saving efforts are very well appreciated. But, I just trust Norton and Mcafee ! though i use virus total all the time but some time i cross check with others.. I needed such kind of comparison.